Amino 9 essential contains 9VAP™ (9 Vegan Amino Pattern) and contains more amino acids than "MAP - Master Amino Acid Pattern." 9VAP™ contains free-form amino acids, which are more nutritive than normal amino acids. The fact that these amino acids are free form makes it possible for the body to absorb them without having to digest them first. The body is unable to produce essential nutrients and depends on our food or a nutritional supplement for these nutrients. How is our product different from MAP™? Read more below. Contents: 150 VegeCaps each containing 700mg. Cells are constantly being destroyed in our bodies and new ones need to be formed. Essential nutrients that are vital to life. Proteins and their building blocks, amino acids, are more than just an essential component of our diet. They form the basic building material for our entire organism. Protein helps our bodies constantly renew the living cells of muscles, organs, bones, anti-bodies, enzymes, etc. The word protein comes from the Greek word proteuo or protos and means first place, making it the most important nutrient in the human diet. What is the difference between Amino 9 essential 9VAP™ and MAP™? 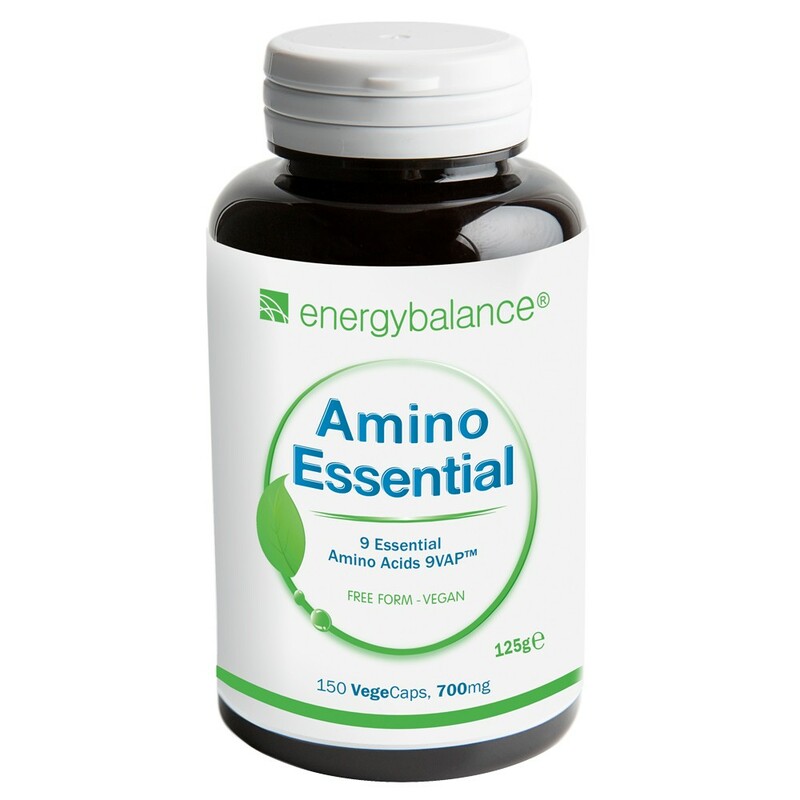 Amino 9 essential with 9VAP™ contains 8 essential amino acids and 1 semi-essential amino acid in cellulose capsules. MAP™ (master amino acid pattern) contains 8 essential amino acids in tablet form. The tablets are pressed without additives (we have never heard of pressing tablets without additives and so are skeptical of the truth of this claim). Amino 9 essential with 9VAP™ is available in practical cellulose capsules and contains zero calories. 15 capsules of 9VAP™ always provide your body with the same amount of body-boosting, high-utilization amino acids, the same amount you get from eating 350g of meat, fish or poultry. The small intestine completely processes Amino 9 essential with 9VAP™ in less than 30 minutes, leaving no digestive end products in the intestine. Its free form means that it is already split so it doesn't require any splitting enzymes. The transitional period in the body for standard nutritive proteins takes 5 to 13 times as long. Followed by eating carbohydrates optimizes absorption. Protein supplement for people in special physiological circumstances such as seniors, pregnant women, nursing mothers, growing children, people recuperating from illness, etc. There are no limitations or intolerances associated with Amino 9 essential with 9VAP™. However, people with extreme protein deficiency/undersupply of protein may be able to feel the regulation and building effect in their muscles and joints, for example. In this case, we recommend reducing the amount of protein you eat, start by taking the smallest dosage of Amino 9 essential with 9VAP™ and then gradually increasing the amount you consume, just like giving water to a person who is severely dehydrated. ¼ h before a meal, number of capsules of Amino 9 essential 9VAP™ accorded your body weight with a little water [(body weight in Kg ÷ 7) or according the table on the label, push Ingredients button]. Amino acids are sensitive to moisture. Store them in a dry place with the lid tightly closed. Moisture can cause some amino acids to decompose. Keep out of reach of children. 100% very pure, free and crystalline (not simple hydrolyzed) amino acids (protein building blocks) from 100% plant-based, GMO-free sources: L-leucine, L-valine, L-isoleucine, L-lysine, L-phenylalanine, L-threonine, L-methionine, L-histidine, L-tryptophane, cellulose (VegeCaps).